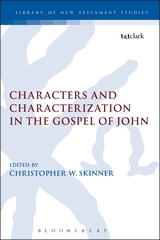 I was delighted to find out, just now, that my book, Characters and Characterization in the Gospel of John (LNTS 461; London: Bloomsbury/T & T Clark, 2013) is now available in paperback. The best part of finding out this news was not receiving the book (which I have yet to do) but having one of my students purchase it, then show it to me! The original hardbound volume costs about $125, while the paperback is $39.95. So, if you were waiting for a more affordable copy, now is your chance! For those attending SBL, you will be able to get it even cheaper.